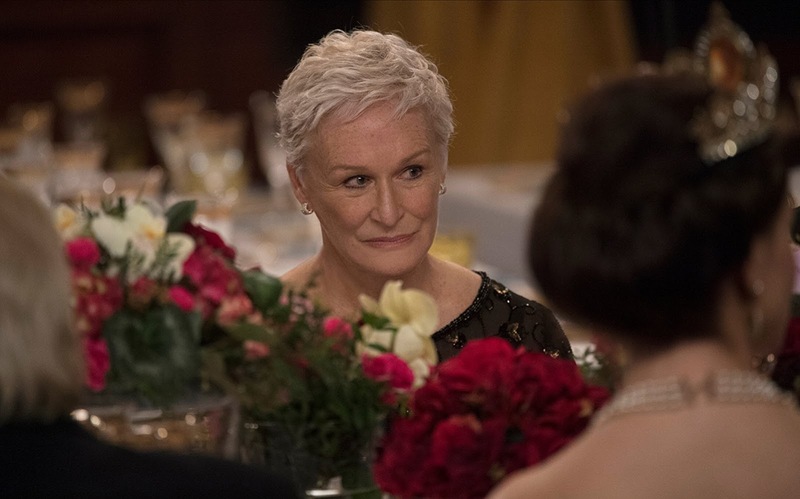 The Wife is Glenn Close's final close-up in Dangerous Liaisons stretched out into a full-length film, and I say that with something approaching awe. It's a purposefully constructed showcase for that face of hers, often inscrutable until it's violently terrifyingly not - she will stop your heart dead. She plays Joan Castleman, the doting and dutiful wife of Joe Castleman who has just won the Nobel Prize in Literature. No medals for Joan though - all she gets are the crumbs in Joe's beard and a day (or maybe less) of shopping in Stockholm. Or so we'd think. Joe's would-be biographer, played by Christian Slater with all of the expected pinch-nosed needling we expect from Christian Slater, has tagged along for the ride, and he starts asking questions the second Joan's alone. And before you know it we've seeped off into flashbacks - how did this loving couple come to be, both a "couple" and "loving," and are they really all that under there? Glenn'll let you know, don't worry. She'll do it with an exquisitely timed cheek twitch, a so brief you might've imagined it crinkle of the skin between her eyes and nose. Unmissable, from the stars. Point being she's fierce here, her every square inch a road-map to the Who What When and How of it. It's a performance calibrated like clockwork - a gleaming Scandinavian prize of its own making. The film around her sorts itself out in quick order - she is what we're there for, and we'll march in tune. It's a pleasure, seeing her feast like this - seeing her trace the cracks across the world's surface and finally dig her paws in hard, splitting the surface. It's more satisfyingly apocalyptic than anything Thanos could conjure up, that's for sure.